This is unique. The gate is surrounded by the painted teeth, mouth, eyes, and nose of an animal. I think it is a leopard. I wonder what the owners came up with the concept of painting the area around their gate. Driving into this gate would remind me of a ride an an amusement park or Disneyland, such as Mr. Toad's Wild Ride. This is the detail of an old gate on one of the older beachfront homes. I like the patina of the work and the rustic hardware. Tomorrow I will show you the entire gate. Please come back to take a look,a s I guarantee that you will be surprised. There is something unique about the gate, and the owners clearly had a sense of humor. This is a view of Casa Roca looking up from Langosta Beach. This is the same house that I showed yesterday. I would be afraid to have a large house that is rented out to large groups of people. I think there would be too much partying going on in the house, including bachelor parties before weddings, etc. Also, there is so much fewer maintenance issues having a condo compared to having a house. It is much easier to take care of a condo than a house when we the condo is a vacation property and we are not there to look after it all the time. Perhaps for those reasons, the price per square foot for houses is a fraction of the price per square foot for condos in Tamarindo. 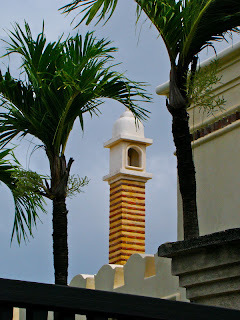 Today is Sunday so we have new photos posted on our Viva la Voyage travel photo site. We are showing another set of photos from Julie's recent rafting trip through the Grand Canyon. I have not been there myself, other than a hike down and back up. Floating the entire length of the Canyon for 10 days is a trip of a lifetime experience. The Langosta beachfront has a few condos, such as ours, and a row of very nice beachfront mansions. This is the entrance to one of them, called Casa Roca. Most of these houses are rentals for people who want to come to Tamarindo with a large family or group. Casa Roca is one of those rentals. It has 5 bedrooms, a pool, and overlooks the same stretch of beach as our condo. Usually the front gate is closed, but I took this photo while walking past when the gate was open. I mentioned yesterday that the clouds at this time of year add texture to the sunsets. They also add shapes to the sky, in contrast to the clear skies during the high season. These majestic clouds over the Pacific are even reflected slightly in the receding waves on Langosta Beach. Here is a classic sunset image from the heart of Tamarindo beach, looking out to San Francisco point. The clouds at this time of year add texture to the sunsets. Here is another photo of homes in the hillside above Tamarindo, with expansive views of the bay and ocean. The government got smart a few years ago. The adopted a progressive element to property taxes, so there is a higher rate of property taxes on homes and condos that cost more than $250,000. I think that makes sense and is fair, even though we have to pay the higher tax on both of our condos. The extra revenue is collected from a lot of foreigners, as Costa Rica is very popular with Canadians and Americans for vacation and retirement homes. Here is a closer view of the houses on the ridge overlooking the estuary. These houses will also have a nice view of Playa Grande and the ocean, which is just around the bend in the estuary to the right. Developers like to build houses on the hills overlooking the Pacific, as people love to have homes and condos with an ocean view. We are now heading back out of the Tamarindo Estuary. As wild and jungle-like as are the scenes of the mangrove swamps that I have shown during the past week or so, you can see from this photo how close we are to "civilization." Those are some of the houses of Tamarindo on the ridge overlooking the estuary. In fact, the estuary is very close to the little Tamarindo airport, which has commuter flights from San Jose. The land around the airport is owned by the Diria Resort Group and they have plans to develop a golf course and homes in the area. They will leave the estuary in its natural state, as its ecology is protected. This is another view that shows that the Tamarindo estuary's mangrove swamp is suitable only for wildlife habitat and wetlands for water runoff storage. In the USA, 50 years ago the Army Corps of Engineers probably would have built a levee lining the estuary to prevent the water from flowing into the swamp so that the land behind the levee could be used for agriculture or developed for housing. The "channelization" the Mississippi River has caused higher floods even when there is less volume of water. It is better to leave wetlands in the natural state, and to allow flood waters to flow into land that accommodates the high water times, other than to protect already populated areas, where people built in the flood plain before people and government had the wisdom to leave flood plains in their natural state. Today is Sunday, so we have new photos on our Viva la Voyage travel photo site. This week we are showing some photos of the menthol blue waters of the Colorado River at the bottom of the Grand Canyon. After yesterday's photo of a giant mangrove tree, here is a photo of yet another giant tree, although this one has toppled over in the soft, damp soil right next to the mangrove swamp. We have photos of ancient Khmer temples of Cambodia on our Viva la Voyage travel photo site this week. This photo shows how remarkable mangrove trees are. Although they are usually small on the shores of the estuary with a thicket of airborne roots, they can also grow towering trunks to become very high. This tree has a tall trunk even though the trunk did not grow from out of the ground. The trunk is airborne, supported by he smaller roots. If you have not yet visited our Viva la Voyage travel photo site this week, I recommend that you do so because we have posted photos of similar trees that have dropped roots down onto the top of some of the ancient Khmer temples of Cambodia. On our little hike through the mangroves we saw lots of crabs, including this frontal angle that shows that the polka dotted crabs have colorful red front claws. Maybe they are not so ugly, after all. This week we have photos of ancient Khmer temples of Cambodia on our Viva la Voyage travel photo site. 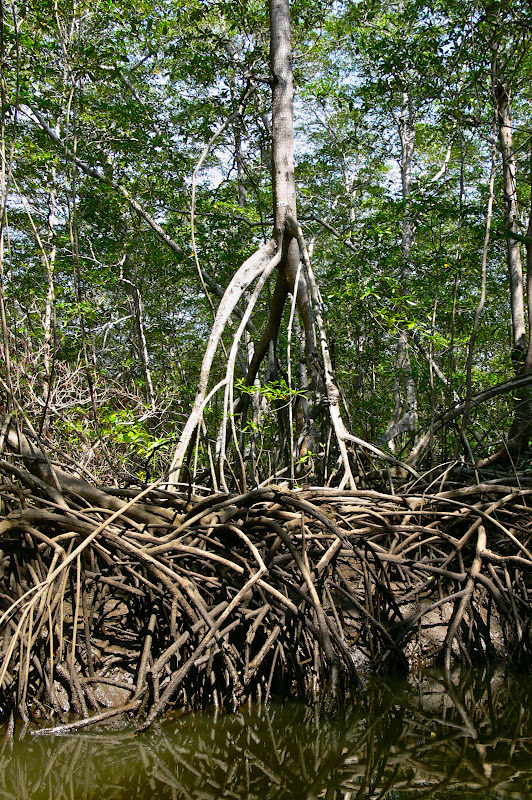 This photo shows how dense the mangrove roots can be in the swampy estuary. It would be impossible to walk through a mangrove forest, except on trails that have been cleared. I think black and white at times accentuates the patterns, shapes and lines in photographs. This bird was perched high on a thorny branch above the estuary. Its beak almost looks like one of the thorns. I assume that it was perched high to get a better view of possible prey in the ground or in the shallow water. Yesterday's photo of a termite mound caused Kate of Visual St. Paul to post a short poem about termites in the comments. I have added it to yesterday's post and highly recommend that you scroll down to yesterday's post to read it. It is cute, and is classic Ogden Nash. Termite nest in a tree. This is creepy. 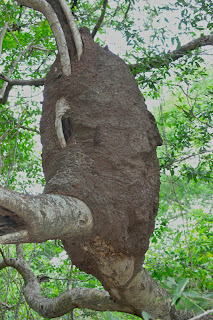 It is a huge termite nest up in a tree. I would expect to see termite mounds on the ground, but I guess these termites prefer a high rent district. I hope the termites stay fat and happy in the forest and stay out of town. I realize that the animals I have shown recently are not exactly cute. Crabs, bats, and termites are at the opposite end of the spectrum to the monkeys and dolphins that I showed a week or so ago. Sorry. This poem has Ogden Nash's trademark twist at the end. Kate left a poem about crabs on my site a month or so ago, and who would ever think that she could find a poem about termites? This week we ae showing photos of some fo the ancient Khmer temples of Cambodia ted on our Viva la Voyage travel photo site. We got out of the little tour boat to walk on some trails amidst the mangrove trees. There were lots of crabs walking around among the roots of the mangroves, as you can see in this photo. I suspect that the polka dots on the crabs are to add camouflage so that they are harder to pick out by their predators. Today is Sunday, so we have new photos posted on our Viva la Voyage travel photo site. This week we are showing photos of some of the ancient Khmer temples in Cambodia. There are bats roosting during the day in the forest near the estuary. This is not a very good photo, as the bat was very dark and I had to enlarge the small section where the bat was located. I did not get very close to the bat, for obvious reasons. Bats are ugly, but very beneficial. They are the major pollinators of flowers that bloom at night, and of course they eat lots of insects. We are showing photos of Bangkok, Thailand this week on our Viva la Voyage travel photo site. The boat ventured close to the mangroves, and there were crabs crawling around on the branches. I would rather look at birds like yesterday's kingfisher than crabs, but perhaps the crabs are useful in providing food for large birds or small mammals. We are showing photos of Bangkok, Thailand on our Viva la Voyage travel photo site this week. We loved it, and we hope you will enjoy our photos. By exploring the mangroves up close, there are opportunities to spot wildlife hiding in the thickets. This kingfisher was perched in the mangroves. He is a little hard to spot, but the wildlife guides have an uncanny knack for finding and pointing out animals. Tiny Costa Rica is home to more bird species than the USA and Canada combined. Its location in Central America caused it to be exposed to plant and animal migrations from both North and South America, adding to its biodiversity. As their name implies, kingfishers feed on fish, and other small animals. Their long, sharp beaks are obviously adapted for catching fish. Kingfishers live widely in tropical climates, however the kingfishers in French Polynesia are endangered due to the loss of habitat. Although the estuary is wide near the ocean, it extends with narrow fingers into the mangrove swamp. The tour boats travel to the upper reaches of the estuary to let people see the mangrove thickets up close. They also stop so people can take a hike on some of the trails that lace through this natural habitat. 25% of the area of Costa Rica is set aside in national parks and wildlife refuges, the highest percentage of any country on earth. That is a primary reason, along wit the biodiversity, that ecotourism is the number one industry in the country. 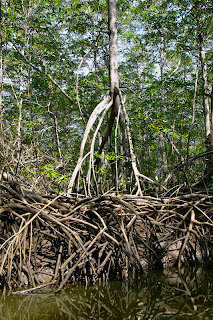 This is a little closer view of the structure of mangrove trees in a tidal estuary. The roots take hold in the shallow sand bar, but there are no leaves below the high water line. The tide flows in and out under the tree. The tree provides habitat for wildlife, as I will show in my posts in the next week or so. These wetlands are also important areas for water runoff during the rainy season. I took one of the little boats in yesterday's post on an excursion up the Tamarindo estuary, on the north edge of town. This is a protected area, as it is part of the Las Baulas National Marine Park. These are mangrove trees that line the estuary shores. 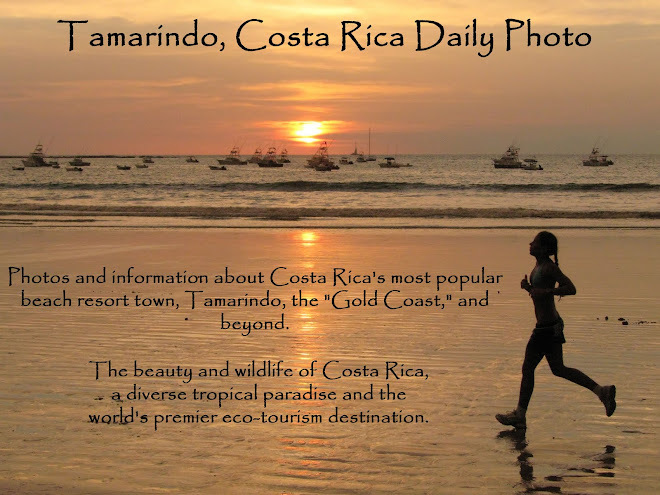 Tamarindo is separated on the north and south by the Tamarindo estuary and the Langosta estuary. This makes the area sort of like a peninsula as far as access from the rest of the area, as there is no direct access to the land across the estuaries. This is the entrance of the Tamarindo estuary, on the north edge of town. It is part of the Las Baulas National Marine Park. These little boats take tourists up into the estuary. It is a nice exposure to the ecology of a tropical mangrove estuary. Across the estuary is Playa Grande, and the beach there is part of the National Park because it is the main nesting site for the Pacific Leatherback turtles. They swim from the area around the Galapagos Islands all the way to Tamarindo Bay to lay their eggs at Playa Grande. There is a major controversy trying to prevent development near the beach at Playa Grande. The lights from development are considered detrimental to the turtles nesting. A recent article in the Tico Times, the leading English language newspaper, predicted declining leatherback turtle populations. During October - March the park rangers will lead small groups in the evening to sit on the beach in the dark at night to wait for turtles to come ashore. My niece, who is getting her Ph.D. in marine biology, received a Watson Fellowship and spent a year studying sea turtles and the impact on the local communities from people changing from eating turtles to the benefits of ecotourism from visitors who want to see the turtles. She spent several months each on Cayman, South Africa, Australia, Indonesia, and Panama. Today is Sunday, so we have new photos on our Viva la Voyage travel photo site. This week we are showing photos of Bangkok, Thailand, which dazzled us with its temples and the bustle of the city during our recent visit. We loved it, and we hope you will enjoy our photos. I showed monkeys yesterday, so let's take a look at another mammal common to our area, dolphins. The Pacific near Tamarindo is teeming with dolphins. The ocean off our shore is part of a National Marine Park, primarily to protect sea turtles. Fishing boats are a popular activity for tourists, and the boats will be greeted by dolphins such as this one, leading the way. This week we are showing more photos of Julie's recent rafting trip through the Grand Canyon on our Viva la Voyage travel photo site it. I have never made the trip, and if you also have not had he opportunity, I think you will enjoy these photos of a unique part of the earth. I have not shown a photo of monkeys in a while, so here is a photo of howler monkeys on a roof across the street from our Langosta condo. One of the benefits of the density controls that I discussed in my post yesterday is that keeping trees in areas such as Tamarindo and Langosta will continue to provide habitat for monkeys, birds and other wildlife, right in town. We are showing more photos from Julie's recent raft trip through the Grand Canyon on our Viva la Voyage travel photo site it. It is a unique place. This photo gives an overview of Tamarindo and Playa Langosta, from the hills above Tamarindo. The southern end of Tamarindo beach and bay is at the top right. Around San Francisco point is Playa Langosta at the center of the photo, just below the horizon. The large white building is the Pacific Park condo in the center of Tamarindo. The Diria Resort condos, where we have one of our two condos, is the building right behind the trunk of the tree on the right. A few condos in Playa Langosta, where we have our other condo, are visible along the tree line in the distance at the top center of the photo. If the country continues the density and height controls that were adopted a few years ago, the area will remain mostly green. The real estate market is starting to improve, so the pause on new construction of the past 5 years or so might be interrupted by some new condo units. We will have to see whether the developers are successful in pre-selling units and getting their buildings under construction. This bicycle caught my eye because of its unusual and colorful blue and yellow paint, accented by the red paint behind it. Except for the yellow, it seems to fit the spirit for the 4th of July in the USA. This 4th of July causes a sad, personal reflection. A nice couple from Alabama had rented one of my condos for two weeks that included the 4th of July week for several years in a row. Last year, they had to cancel shortly before their trip because the wife was diagnosed with a brain tumor. She passed away a couple of months ago. The husband is returning to stay in the condo again at this time this year because his late wife enjoyed it so much and he wanted to do the things that she liked to do. This is so sad, and it is a reminder to all of us to enjoy life and our time together while our health permits us do so. Plants and life are not all flowers and sunshine. Hopefully you do not encounter many thorns in your life. Here is one more look at the delicate yellow flower that I showed the day before yesterday's Theme Day interlude. I confess to being not very knowledgeable about flower species. But, that does not stop me from posting flowers when I like them. This week on our Viva la Voyage travel photo site we are showing another set of pictures from Julie's recent raft trip through the Grand Canyon. I have hiked to the bottom of the Canyon, but have never floated through it. It is a unique place. The worldwide Daily Photo Theme for June 1 is "Chimneys." This was a challenge for me, as there are very few chimneys in Costa Rica. There is never a time of year when the climate would justify having a fireplace. This is the closest I could find to a chimney. It is a tower on Casa Marrakech, a beachfront mansion a few doors down the beach from our condo. I showed a series of photos of it a month or two ago. Today is Sunday, so we have new photos posted on our Viva la Voyage travel photo site. We are showing another set of pictures from Julie's recent raft trip through the Grand Canyon. I have hiked to the bottom of the Canyon, but have never floated through it. It is a unique place. The normal link to the City Daily Photo site for all other participants, which I have included below, is temporarily not working. In the meantime, here is a link to a temporary website that shows the Daily Photo bloggers' posts interpreting the theme day for chimneys. also you can check our group on Facebook).